Shaking the Paralysis in America - Get the Lead Out! The recent repetitive waves and tidal surges of bad news that we've all had to deal with have left us numb. Detachment is an innate defense mechanism that kicks in when our senses are overwhelmed with negative input, pain stimuli, and/or fear triggers. I'm sure you can add a few more fear factors to personalize this list to your own situation. The result for many has been a kind of debilitating shock. That's fine, for a while. But eventually it's not OK anymore. My point is, sometimes you just have to make the effort to get back in the ballgame. If you sit for too long, you become irrelevant. Your life and your future become pointless. It's a fair comparison to look at those who are unemployed long enough ... they become discouraged, stop seeking work, and the government even stops counting them in the primary U.S. unemployment statistics, since the "numb" become so irrelevant. The overriding, unconcerned attitude of officialdom is, "If they stop caring about themselves, why should we?" They consider those detached folks to be out-of-sight, harmless, and non-involved. In other words--no threat to the agendas of the moment. Are You Ready Yet to React? Think about how you felt a while back--maybe it was years ago now--when you knew times like this were coming. Perhaps that prescience is what got you involved in crisis preparedness in the first place. You worked and invested yourself in getting ready--in becoming informed on many levels, in preparing your loved ones for the days when everything would change, in positioning your household to weather the storms. Well, here we are. It's the change we believed would come. It is in process. Yes, the shock of an incessant, intense rolling series of "disturbances in our force" put many of us on the sidelines for a while. In a way, it's like we couldn't believe our eyes and ears that this is all happening so fast. But now it's time to get re-engaged. We're at the stage where preparedness is less of an objective, since we are presumably as ready as we can be in that way. It now has to be about awareness, analysis, and activism ... steeling ourselves for the struggle ... re-energizing ourselves as the changes still to come will undoubtedly be coming at us at an accelerating pace. The "Get It Done" Comprehensive Food Package is On Sale! If you're just now coming to realize that the sun is setting on your chance to prepare for the dark days ahead, well--we have your solution. Safecastle's "Get It Done" Comprehensive Emergency Storage Food Package is sale priced to get you value and quick peace of mind--increasingly elusive these days. The 84-case food package is made up of the very best storage-food varieties on the market--top quality, fresh from the suppliers, longest shelf lives, the kinds of food Americans are used to eating. The package is discounted $2250 and it ships free to the lower 48!! What's it really worth to you? Well, this package provides a total of 1.2 million calories. That's 1,200,000 calories! At the level of 2000 calories a day, that translates to 600 days for one adult. 84 different full case food varieties, to include the best freeze dried entrees, wet-pack meats, salt, spices, coffee beans, comfort foods, and more. The top food brands in the marketplace. Everything a body needs to survive and thrive. Canned and packaged to last for years ... decades in fact. Buyers club members also get a free Excalibur food dehydrator and a can of emergency non-hybrid veggie seeds as a part of the package price. In times like this, it's critical we put our available funds into assets that will at the very least retain some inherent value. Is there anything that better fills that description than high-quality storage food? Empty Store Shelves Coming to America - Nat'l. Inflation Assoc. As you probably know, the Bega brand canned cheese and the Red Feather canned cheese are identical--just different labels. 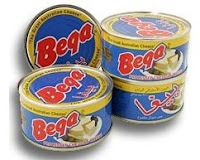 Bega is actually the company that produces the cheese and does the canning. We have sold both labels in the past. Now we are offering the Bega label to you at the exact same low pricing as what the Red Feather cheese was offered for in January of this year. Buyers club member pricing is $111.20 for a case of 36 7-oz. cans. This stuff is very popular and getting more so with each shipment that comes ashore here from Australia. For those of us who are into preparedness--it is a perfect addition to the larder. It needs no refrigeration and stores indefinitely. That means years ... decades even! And of course, as always, it ships free to the lower 48.